New selection of black metal records released in 2018. For the new Check 'Em All material, we latest albums from such acts as Sulphur Aeon (DE), CNTMPT (DE), Odious Devotion (FI), Sigh (JP), and Shibalba (GR). Sulphur Aeon — "The Scythe of Cosmic Chaos"
It seems in recent years death metal has truly embodied its namesake, sterility and stagnancy in the genre has marred the genre for a great many years now (save for a few exceptions), to find a band that can balance the fury of classic death metal with production that is modern and yet not lifeless, with songs that can still sound fresh. Fortunately Sulphur Aeon don’t fall into this category, and whilst "The Scythe of Cosmic Chaos" isn’t bringing anything particularly new to the table, it’s well thought out; with some killer riffs, great performances on every facet of the music and all wrapped in some delightfully melodic brutality. The production does a grand job of juggling modernity and clarity whilst still feeling imposing and conveying an atmosphere of a juggernaut lurching onwards, destroying all in its path. The songs are structured amazingly, with so many additional features and nuances that really separate this album from a by-the-numbers death metal record. It may not be be changing the face of death metal but it definitely showcases the potential still left within the genre. Instrumental black metal is a genre that is tricky to pull off, whilst it’s a genre that is rife with vast periods in songs without vocals, to try and achieve that 100% is something that is hard to do if you still want to create compelling music, metal particularly is a genre that is brought to life by the vocals, that being said there are acts that exist that can achieve pure instrumentation and still be powerful, Aluk Todolo would be my top candidate in that arena. Somewhat related and yet still incorporating vocals would be a band like Mgla, who have built a career on repetitive and simple songs with at times minimal vocals and yet are still able to create captivating music, mostly due to the superior chops of drummer Darkside ("With Hearts Towards None VII" for example), CNTMPT sit somewhere in the middle of these bands which is good company to be in, "Towards Neglect" does have some vocals but they’re textural inflections, not a focus point of the music, and whilst the songs do meander and shift things can get repetitive at times. Had the drums had some more variation to breathe new dynamics into the songs I’m sure the album would be a lot more enthralling. Musically "Towards Neglect" feels like a sponge for most of the history of black metal, at times touches of Marduk, Burzum, Drudkh, S.V.E.S.T., Katharsis, Ulver, Mgla and many more can be heard, and there are some killer sections and melodic lines introduced throughout; that being said I can’t help but feel that if there were some more prominent vocals introduced it would bring another dimension to the album. Odious Devotion — "Odious Devotion"
I don’t know what it is about the Finn’s but it seems like so many of them have an in-built sense for creating strong and melodious black metal, Odious Devotion follow in the footsteps of such great acts as Havvukruunu, Horna and Sargeist; which is to say the tradition of the 2nd wave runs deep within them. "Odious Devotion" is a strong effort, packed to the brim with ethereal and haunting melodies, wrapped up in album that is meandering and undulating between classic tremolo picked blasts, punk/thrash inspired sections and ambient passages. Tonally, the album is raw and has a lower production value than is the norm these days, it’s treble heavy, lending itself towards a more 'classic or traditional' tone, fortunately all of the instruments manage to retain their character and are distinguishable within the mix. As a debut album, "Odious Devotion"’ is a significant arrival, each song is enchanting, well planned and executed perfectly, even the 'ambient' tracks "Stagnant" and "Outro" work well as a bookend to each half of the album, a nice touch if the album is to be pressed to vinyl. It is sure to appeal to fans of classic 2nd wave material as well as more recent acts like Weigedood, Havukruunu or Mgła. Sigh — "Heir to Despair"
There are few acts that have managed to continue their foray into 'weirdness' and be as successful or as consistent to the degree that Sigh have; enigmatic, irreverent and without parallel even from bands like Solefald or Kekal. "Heir to Despair" is a non-stop excursion into controlled insanity, the depths of influence that are plumbed are staggering, yet, perhaps the thing that is more astonishing is the fact that at no point does anything feel forced or gimmicky, each eclectic element is manipulated into the fabric of the songs masterfully, regardless of what’s happening, it’s all vital. "Heir to Despair" is a continuance of Sigh’s unique musical expression and is just as good as their near perfect last outing "Graveward". 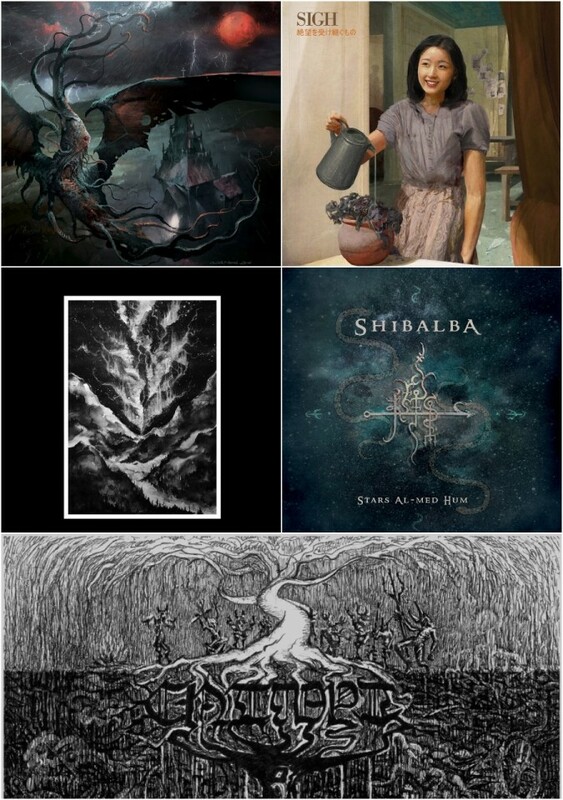 Shibalba — "Stars al-med hum"
Electronic ambient has always been fertile ground for metal musicians and particularly black metal musicians to express their more melodic and less aggressive tendencies. Shibalba is the side-project of members from Acherontas and Nåstrond and focuses on producing meditative ambient or ritual ambient as it’s more commonly known. I’m a fan of ritual ambient, bands like Lapis Niger, Arktau Eos and Ho Ophis have all been acts that I’ve enjoyed in recent years, the biggest positive and drawback of ritual ambient is that it is a genre in which it doesn’t take a lot to be good, if you enjoy ritual ambient then I believe you’ll enjoy most artists within the genre, which means it’s easy to be appreciated, the challenge is that it’s then hard to elevate one group’s output above another because there often are little musical elements or skills displayed that bolster one group above another, that being said, Shibalba have created an interesting and well-rounded release. Sure to please fans of ritual and dark ambient, and a good starting place for anyone interested in the genre. It’s not the most original album but it’s competent and well produced within its domain.